The Beauty of Ugly - Why is the Cape Griffon Vulture going extinct? 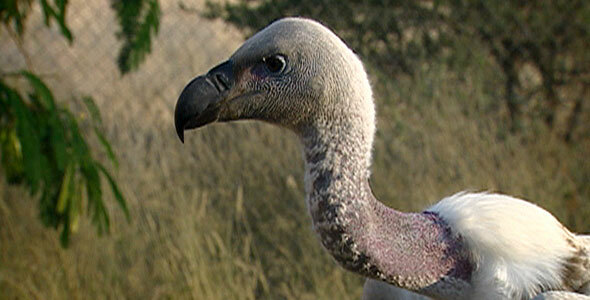 The Cape Griffon vulture, the largest bird of its kind in Africa, is also one of the most endangered. Listed as “vulnerable” to extinction by the World Conservation Union (which is similar to “threatened” on the Endangered Species List) the Cape Griffon vulture has suffered a significant population decline over the past few decades. Among the dangers faced by the Capes, which are confined to a small area of south and southwest Africa, is electrocution on power lines. In addition, changes in the migration patterns of large game herds and an increase in domesticated animals (which are usually buried when they die) have diminished the amount of food available to the birds and led to dietary insufficiencies. Of more concern, however, are mass accidental poisonings, says Maria Diekmann of the Rare and Endangered Species Trust (REST) in Namibia, where Cape Griffon vultures are the most endangered of all animal species. Farmers and ranchers commonly poison the carcasses of animals to kill predators like leopards and jackals, which prey on their livestock; the birds, which are carrion eaters and feed exclusively on dead animals, are inadvertently poisoned. “Poison is cheap, easy and effective. The problem is that they do it incorrectly or get incorrect information from the supplier and instead kill non-targeted species. I am also a farmer — our farm faces the cliffs of the last roosting site in Namibia — so I know the problems that they can have. We try hard to work with them,” says Diekmann. 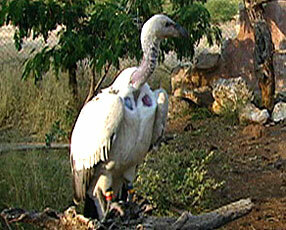 The Cape Griffon vulture has suffered a significant population decline over the past few decades. “The Cape Griffon vulture is what I would call a ‘super vulture.’ It is bigger, eats more, only roosts on cliffs; the needs are more specific. I think that all of our vulture species are declining. We just see it in the Cape first as the numbers were lower to begin with. [It] is an indicator species of what is probably going on with them all,” she says. The decline of vultures has particularly dramatic implications for the rest of the ecosystem. This is because vultures rapidly consume the bacteria-riddled bodies of dead animals, which would otherwise spread disease. The vultures themselves appear to be immune to many of these diseases. “The fact that they eat together and can consume a carcass in an hour seems to prevent most of these diseases from spreading to our wildlife and domestic animals,” Diekmann says. To help conserve the Capes, Diekmann and her colleagues with REST, along with other vulture experts, have begun outfitting the birds with satellite telemetry collars, which allow their flight, breeding, and feeding patterns to be monitored and provide information about the sources of contaminants in their environment. “This gives us baseline data to work from, instead of checking the wind and guessing,” she says. With these and other efforts, Diekmann is hopeful that the Capes can be saved: “Vultures respond well to conservation. A little goes a long way. If we can handle the poison issue, which we are starting to, that can save the population. I am not much of a gambler; I go for the win, and a loss here would be too big of a loss.